As we all are living in the world of social platform we can have the arena for every field. Same is with the discord as it the social platform for the gamers. Be it be any game you have the interest in, you can be the part that respective server. I myself is with one server and play according to it as brings in the community close and will give your presence to the chat server of that game. But sometimes its not worth, and what I tell you this article about being invisible in discord, wouldn’t that be great? Yes, you are right saying that it takes few seconds to get log out of the discord and sit quietly, what if you miss the important message from the server or any person’s cry for help. I use the discord server for the game Pokémon GO, and I logged out discord by being irritated and when I logged in missed the report of my Pokémon was attacked by someone and has come back from the assignment at a poke Gym as people were defending it and were calling to help. These things could happen but here you have the option of becoming invisible and visible to your friends as an option by being invisible to another person. 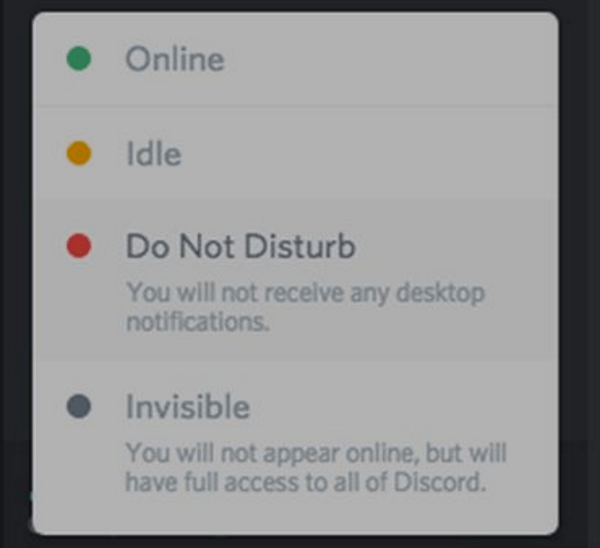 Discord behaves in four manners for its users to other user by showing there mark as being online, Idle, Do Not Disturb and Invisible. Online speaks for itself, idle is the part where you are seen as present but absent not doing any task. However, do not disturb is something when you are in middle of warm conversation and want other chat server at hide mode then you come up with do not disturb status. Where as being invisible is the part of being there without any sign of presence. To manually set yourself to invisible in Discord, just right click your avatar within the program and select Invisible from the popup box. It will remain active until you log out of Discord or manually set your status to something else. A great question was the second query I had in last article that if you being an admin of the server or any fellow user can you get to know any invisible user is there? Then the answer for both the aspects is no, as meaning invisible is same for all, so the case of people being invisible creates the problem for the server admin to calculate the peak time of users and the least active time for the server. Where as if you are planning an event or the raid it will be delivered to the invisible user too but will not be in the list of the raid organiser as that host can’t see you. This plays the both end game in case of user as well as the server, it could be twist for server admin as the time he thinks of adding the roles being least active the server starts creating problem which might be the thing of developing issues. And for the users who are hidden they are being avoided as not being calculated for the purpose. Not like the real world our social world is a free place for everyone and also any introvert can be here for as much time he wants, we matter your privacy and offers you the access that can help you to hide whatever game you play and be in the contact with its com unities and chat servers. There could be people who are secretly cloning the game or using the changed data and don’t want their mates to know it. STEP 1: look for the small cog Settings icon in the bottom left of your Discord screen. STEP 2: choose Games from the left menu. STEP 3: Switch off ‘Display currently running game as a status message’. As I said discord is based on roles and permissions, it could be possible that switching off the display may not work for every server as they have not yet assigned any role to that permission. STEP 1: Log into Discord and select User Settings. STEP 2: Look for Connections. STEP 3: click on Disconnect Sync to turn it off. STEP 4: click on Display Username and turn it to off. So, giving it a break, using discord is as complex you can make it and as easy you want it, the choice is yours. Like all time, will be happy to hear from you in comment sections bellow, do share.